We have Two Seating Times. Seating’s are at 6pm and 8:30pm nightly. We are open seven nights a week. We close briefly in the spring and fall off seasons. We are not capable of providing catering due to our size. Arrive 5 minutes early to park. Our lot fill quickly, and you may have to park around the corner. The free shuttle bus in town is a great option! The free shuttle bus stop closest to us is "Old Town Hall". Seared Prime Ribeye Cap, Garden Snipped Arugula Leaves, Fried Capers, Mustard Cream Sauce, Heirloom Cherry Tomatoes, White Balsamic "Caviar"
Raw Japanese Yellowtail Sliced Thin, Shaved Fennel Slaw, Pickled Exotic Mushrooms, Spiced Carrot Coulis, Soy Sauce "Caviar"
Intimate dining experience. Love the decor and service. Food and wine were excellent. Food taste and presentation was excellent. Service was top notch and timely. Decor leaves a lot to be desired. Seating is horrendously uncomfortable - wooden benches at every table. Really took away from what could have been a great experience. Amazing. David is truly a gifted chef. The staff is wonderful. An amazing experience. SoupCon rivals any fine restaurant in Paris with all the benefits of warm and welcoming service. They have hit the mark on every count of fine dining. Don't miss an evening there. Soupçon never fails to impress. The food is exceptional and the service impeccable. Definitely one of our favorites restaurants in the world. It was a little overpriced for the meal, and a little slow once we made our order. The environment is very good as it is small, but did get a bit loud. What a disappointment. My Husband and I had talked about going here for years and when I got a bonus we decided to splurge. To start the martini's were 17.00 each AND they were tiny. The starters were all 20 plus and were not delicious. My husband had duck, which he said was good but not 48.00 good. My Halibut was presented nicely but had no taste what so ever. We expected to pay what we did but expected to have an outstanding dining experience and did not. Nice ambiance, good service, average food... TOO EXPENSIVE for the food quality. We took advantage of the off season locals’ special. Three course prefix and wine pairings. Everything was excellent. We went to Soupcon for my Husband's birthday....and wow. The unique dining experience made it so much more than just having dinner. The little cabin only seats about 50 people and it felt very intimate. There are only two seatings per night, so you do not have people coming and going during dinner. Five stars all around! I gave the food a 4 star only because my Husband's fish was slightly dry. The bacon appetizer and the short ribs are an absolute must. If in Crested Butte, this is a must stop for any special occasion. Delicious! The service was wonderful and the food was so good! Pricey but worth it. I’ll be back. 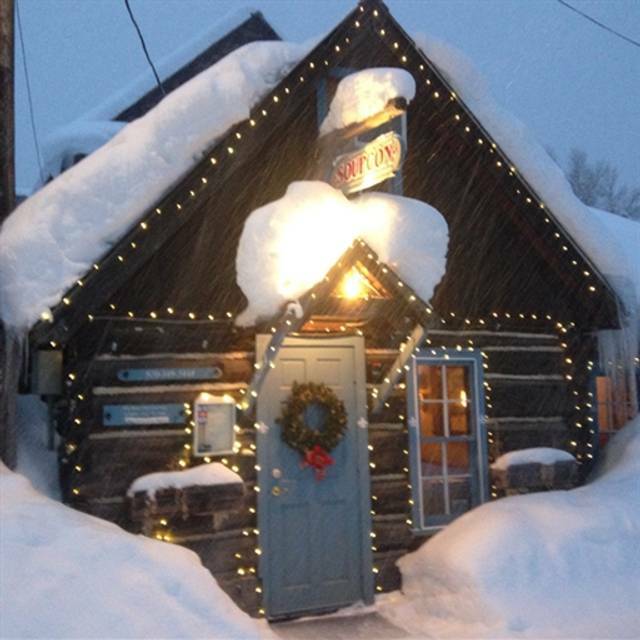 A long time fixture in Crested Butte - personally my favorite Colorado restaurant though admittedly I am not a traveling food writer and have not been to all the greats. The setting is intimate service very personal - reminds of Paris in many ways. Worth a detour and a must for fine dining enthusiasts if in the area.